The Feasibility Study was supported by the Highland LEADER Programme. Photos kindly provided by William Sutherland. 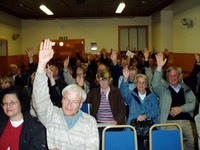 “Hands up” was the call as a public meeting voted overwhelmingly in favour of proposals for a new Community Centre in Dornoch, following the feasibility study which we carried out in partnership with Jefcoate Anderson Architects. • what should a new centre contain? • what might it look like? • how much would it cost? • what should happen next? We reviewed survey data from an earlier public consultation, ruled out uses already earmarked for Dornoch Academy Sports Facility, and agreed a practical set of functions for the building with the Community Association. A site had already been identified but support for alternatives remained. So we looked at the options, consulted Highland Council, SEPA and others, and confirmed the reasoning behind the original location. We then produced an architects’ brief, from which Jefcoate Anderson developed a potential layout. This was not a final design but enabled ideas to be tested in discussion with the Community Association. We also consulted widely with interested parties at this stage, and took some new ideas on board. After some changes to the layout, order of magnitude development costs were calculated. Meanwhile, we helped the Community Association prepare an operating budget for the new centre, following best practice. This was to demonstrate to funding bodies that, once the new centre had been built, the Community Association would be able to run it with a reasonable operating surplus. At the same time we mapped the project against Scottish Government Targets, National Outcomes and Scottish Rural Development Programme (SRDP) Priorities. We and Jefcoate Anderson produced materials for a 3 day exhibition, and then fronted the public meeting. Public feedback was taken on board for the final report.